I love it when I meet people that are breaking the mould, jumping out of the security of day to day 9 to 5 jobs and following an idea, passion or path that they are working relentlessly toward. I've had the pleasure of getting to know Stefan and Sean, the Co-Founders of Upside Racks and they personify this. They have just launched their first product - The Upside Rack and it could just change the way you carry your bike. The guys have just launched their first product, the Upside Rack after a long development and testing phase. We've had a look at their first production model and can't wait to get one in for review. The Upside Rack basically throws out the rule book when it comes to bike racks. They have taken their huge chunks of professional experience from working with big automotive companies to think differently, innovate and come up with this new products. 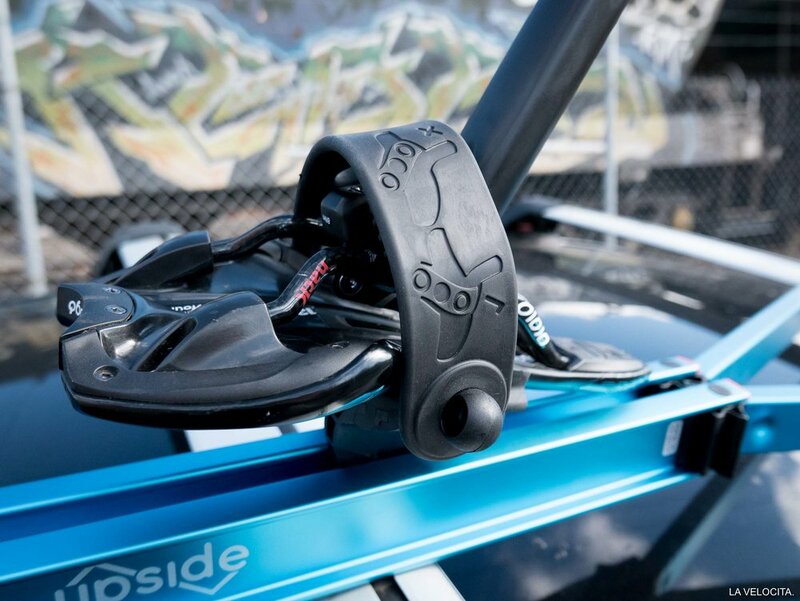 In a sentence, the Upside Rack mounts to your bike's bars and saddle, you then flip your bike 'Upside' down onto the cross bars on your roof rack and secure. I really like that you can swap the bike between cars in a matter of seconds, there's no need to have multiple racks on all your mates cars anymore. Fitting the rack to the bike then placing the bike on the car can be done easily in 30 seconds, it's simple but so different. Having a play with the Upside Rack last week was great, it's a well finished product that comes in a nice case that can handle carrying any other bits you need while on the move. The rack itself is lightweight, is fitted with a torque limiter to prevent over tightening, is lockable via an electronic lock and also includes a card to place on your car's air vents to remind you that your bike is up top together with tough rubber bands to hold your brakes on to stop the bike's wheels spinning while you are on the move.